So last week I told you about the weekly events going on at ULTA for their annual Love Your Hair Event. Check those out here. There have been daily deals, too. If you have an ULTA account, I'm sure you've seen the flyer with these deals. But I wanted to share a quick reminder of these daily deals before the event ends! So head down to ULTA or visit online and check out these deals! Read about ULTA Weekly Events here. must share with my friend, great promotion. Ohh that Blow Pro wand is a great price! I might have to head down there and check it out! Awesome, I'll definitely need to check this out! So many great deals to be had! Thanks for sharing! Nice! I've read great things about Carol's Daughter! So many amazing deals! I could use some new hair products! I missed this promotion! So many great deals! Thanks for sharing! These deals are absolutely wonderful! Great deals! I'm definitely more of an Ulta shopper than Sephora and there's one only 2 minutes from my work so I'll have to go check out the daily deals this week. Oh my, these are some great deals!!! I just bought some Rusk stuff at TJ Maxx yesterday, but for about the same price as the sale so I am glad I didn't pay more haha I would have been mad :) Thanks for sharing! It all sounds amazing! 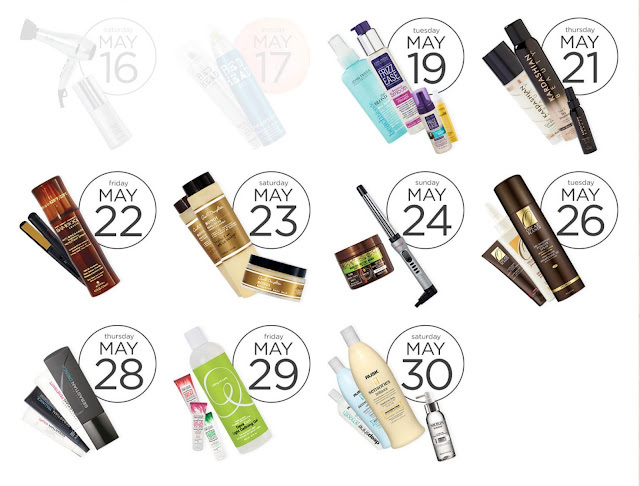 I would take May 24 with the Macadamia Professional nourishing mask and the Blow Pro! I have dry hair and I really always look for masks or creams to help moisurize it! these are all awesome.. thanks for sharing. I had no idea. Great deals! I can't wait to see what you end up getting, Elle! Those are some really great deals!! The 23rd and 24th are on my radar. So many good deals! Thanks Elle, this is so great! !